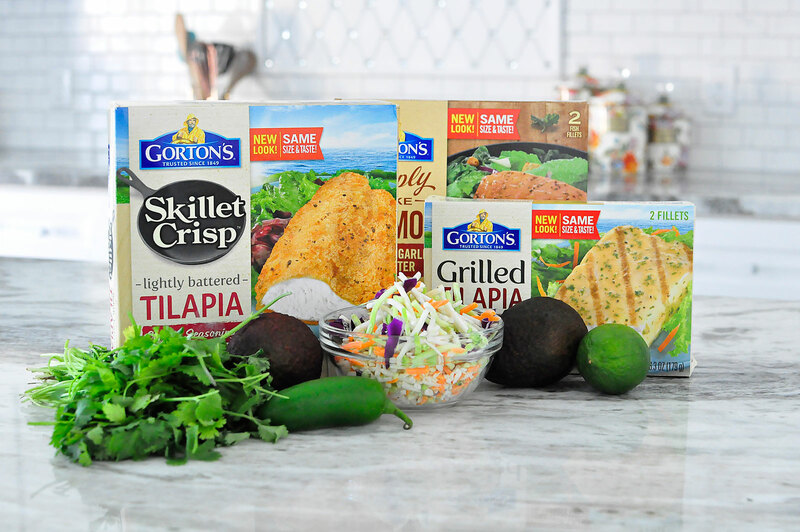 I’m excited to be partnering up with Gorton’s today to share a tasty tilapia street taco recipe that will be a hit at your next Taco Tuesday gathering. As most of you know, I’ve been doing Weight Watchers for awhile now. I really like the flexibility of the plan, but for me to be truly successful and in control I find it’s best to make my meals at home. This has been a pleasant and fun experience since moving into the new house because I puffy heart my kitchen. For my Weight Watchers friendly recipe with Gorton’s, I chose to use their Skillet Crisp Lightly Battered Tilapia. 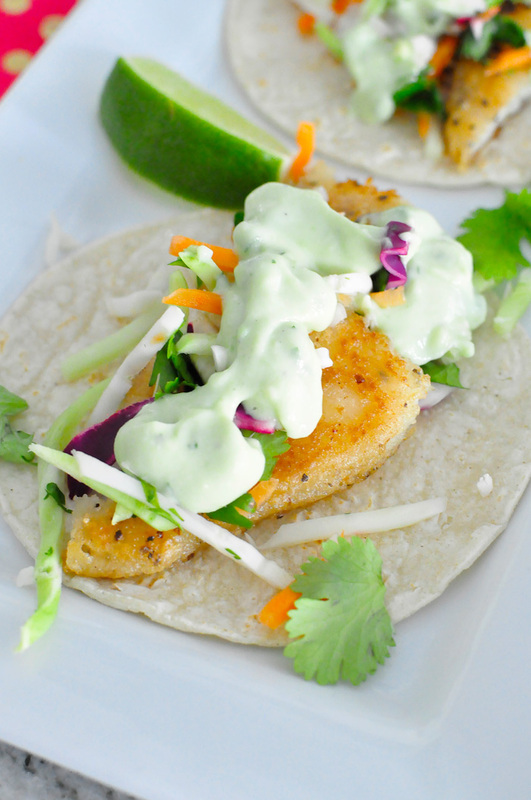 I love fried foods in tacos (hence why I’m on Weight Watchers…the struggle is real), and this tilapia has a gorgeous, light, crispy batter that I knew would be amazing in a taco. I tend to cook about 3-4 nights during the work week, and I strive to stick to meals I can have on the table in under 30 minutes. I also try to pack a ton of flavor and veggies to make healthy food that is delicious and a joy to eat. 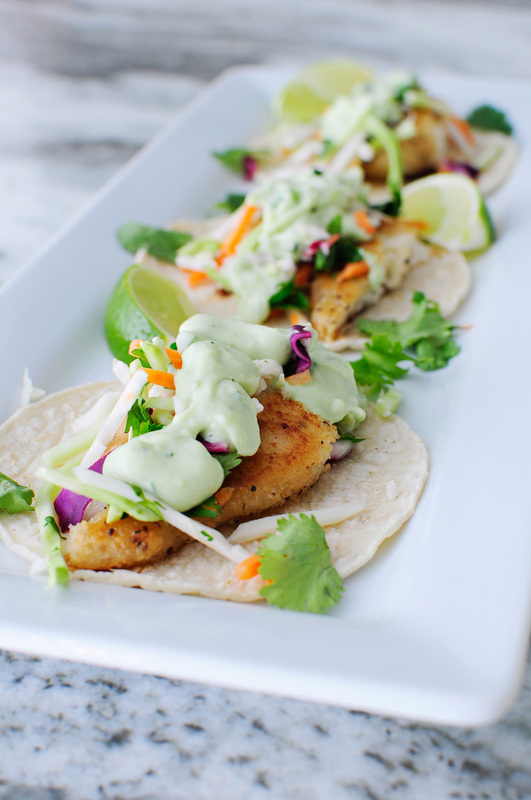 And these tilapia street tacos are fun to eat– they have a crunchy veggie slaw, a creamy avocado jalapeno cilantro dressing, and are wrapped in a warm mini corn tortilla. Add a squirt of lime and you’ll feel like you’re at a beachside restaurant enjoying life. And did I mention that a serving size is THREE tacos? Ok, you’re probably like, please get onto this delicious recipe, Monica…so here you go. 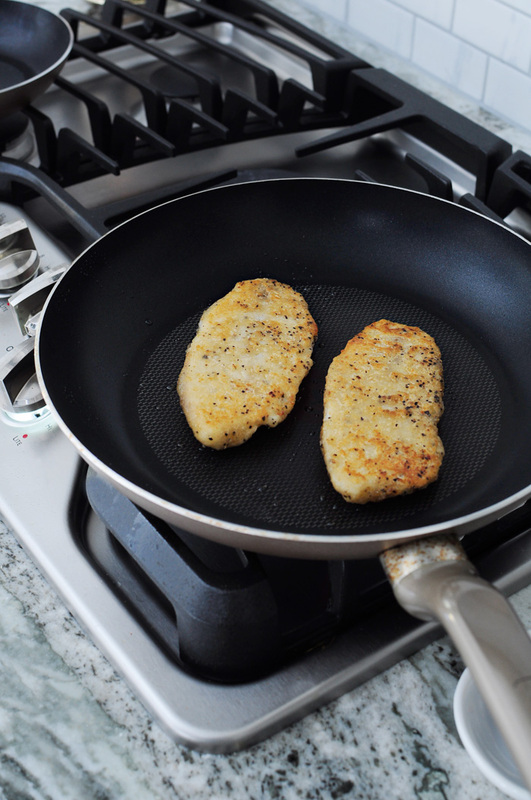 In a non-stick skillet, heat up the frozen (do not thaw!) Skillet Crisp Lightly Battered Tilapia fillets for about 18-25 minutes on medium heat. Flip every 5 minutes until golden brown and cooked. 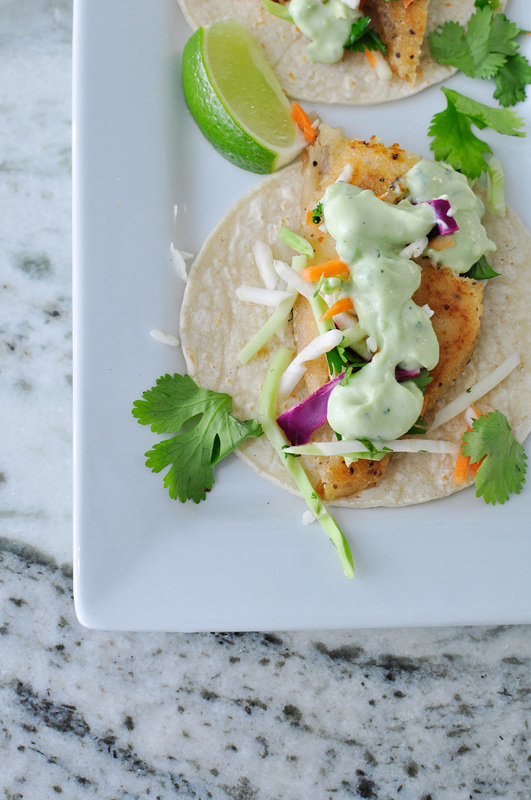 While your tilapia is getting nice and golden brown, make your slaw. I cheated and used a pre-made veggie mix that has julienned broccoli, carrots, red cabbage and cauliflower to help speed things up for a weeknight meal. 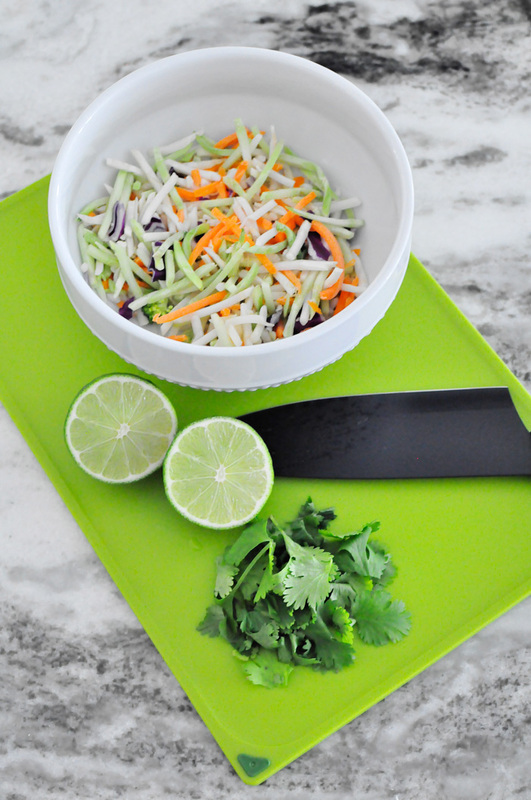 In a bowl, simply combine the veggies, juice of one lime, cilantro and a dash of salt and pepper and mix together. Set aside. 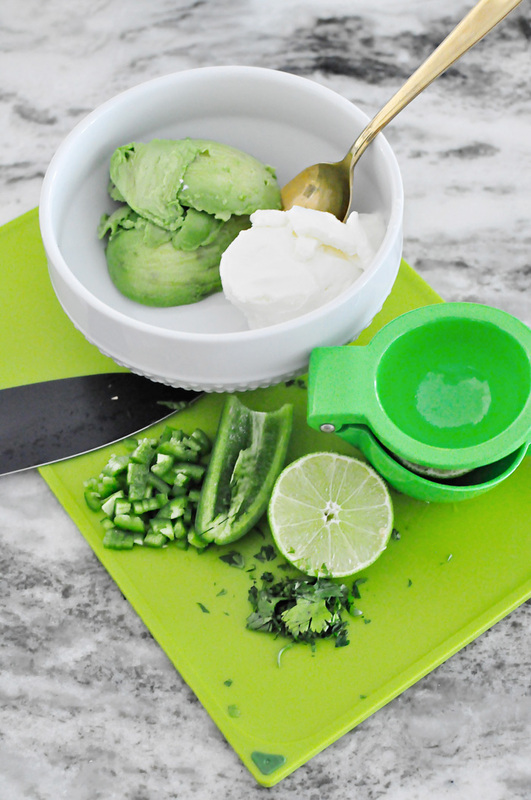 In another bowl, combine your ripe avocado (pitted and scooped out), sour cream, jalapeno (leave some seeds in if you want some heat), juice of one lime and cilantro. Mix well until it’s all incorporated and add in salt and pepper to taste. Up next, heat up your mini corn tortillas. I used a flat griddle to heat up about three at a time. 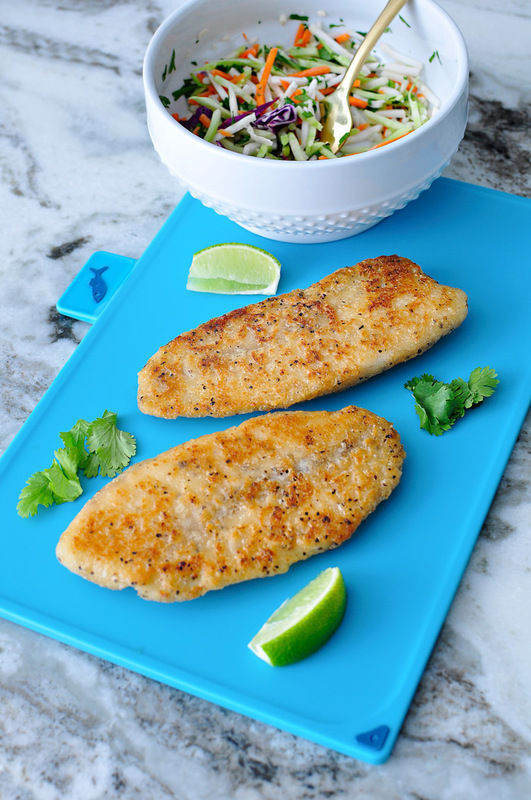 Take your tilapia fillets out of the pan and put onto a cutting board. Cut each filet into about three long strips. Then cut those strips in half. Look at all that food. A tip I have is to invest in fun plates to make your food a dining experience. Save the paper plates for another time. I think this plate looks like something from a hipster tapas bar. The tilapia is crispy and delicious. Flaky, tender and so full of flavor. 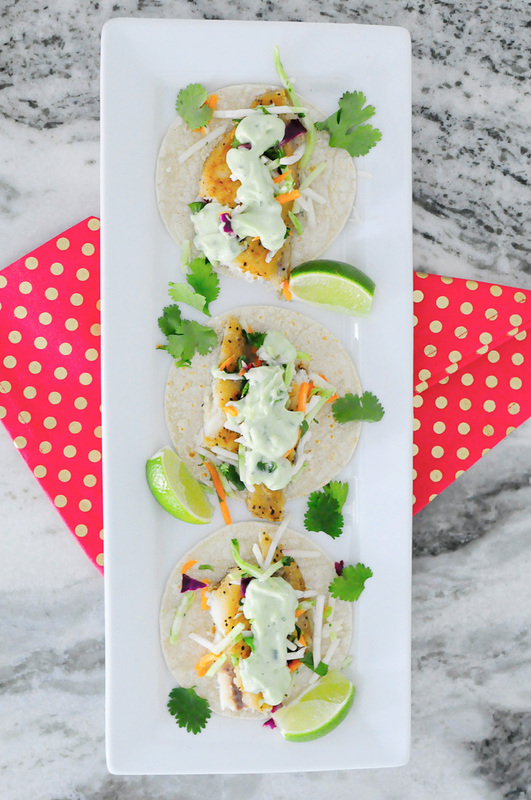 The classic seasonings pair well with all the flavors happening in these tacos. The crunchy slaw and creamy dressing take it over the top. At only 11 Weight Watchers Smart Points, this meal will be on repeat in our household as a quick, easy go-to dinner. You’ll likely have some dressing left, and it’ll keep about an extra day or so in the fridge. You can use it with some kale chips or on a salad for lunch the next day. It’s so versatile. I hope you’ll at some Gorton’s products to your grocery cart the next time you go shopping. They’ve been feeding families for 167 years and are committed to quality, tasty seafood. They also have grilled salmon, fish sticks/tenders for the kiddos, and other healthy, fresh options to make dining in as delightful as dining out. Hope you enjoyed this recipe! xo. Oh goodness, this looks sooo tasty! I'm going to make those tacos. Thanks for the recipe.